Hey there! Thanks for dropping by Magical Places! Take a look around and grab the RSS feed to stay updated. See you around! If you look at most of the pictures of me on here, you will probably see my oh-so-attractive fanny pack (I mean that sarcastically, of course, it’s a fanny pack for goodness sake). I pack it with pretty much everything I need and bring with with me to the parks, but I know it can be difficult making sure you don’t forget anything. So here’s a list of what I bring out for a day of fun. I hope I haven’t forgotten anything, but if I have, I’ll add it later. 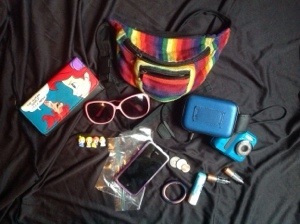 What’s in your purse/fanny pack/pockets on vacations? We will strive to provide our readers with accurate information and honest opinions. Please use your discretion before making any decisions based on the information in this blog. We will not compensate you in any way whatsoever if you ever happen to suffer a loss/inconvenience/damage because of/while making use of information in this blog.